This silver plated Irish photo frame features embossed shamrocks and would be an ideal Irish baby picture frame. This silver plated Irish picture frame features embossed shamrocks across the top and holds a 3 1/2” wide x 4 1/4” tall photo. The shamrock photo frame measures 5 1/4" wide x 7 1/8" tall and has a tarnish resistant silver finish. 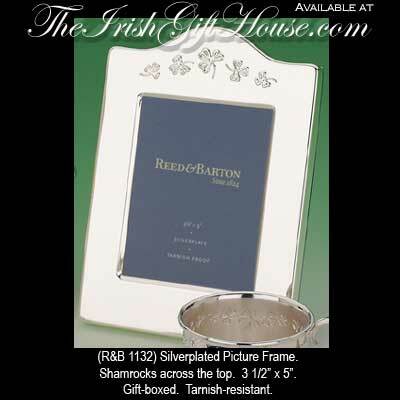 The Irish photo frame is made by Reed and Barton Silversmiths and is gift boxed with a shamrock history card that is complements of The Irish Gift House.